Over the last couple of years we have tried lots and lots of different subscription boxes for dogs. Chester and Gretel have enjoyed eating and playing with the goodies but the “surprise” is lost on them. I, however, am addicted to getting mail. Especially unknown mail. I thought, why should the dogs get all of the fun? I started ordering some subscription boxes for myself. One of those boxes is the Cairn Box. 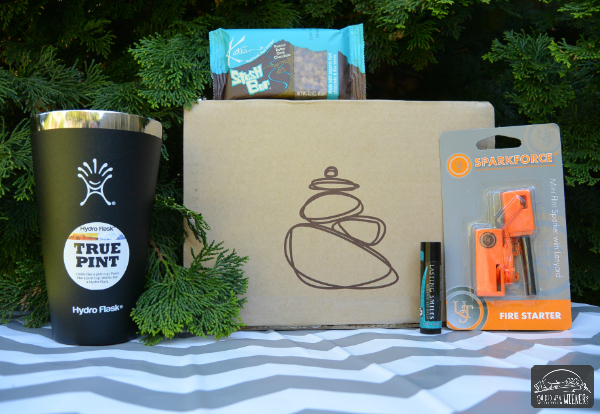 The Cairn Box is a good fit for me because this unique box delivers outdoor related products to try every month. I am a total gear and gadget junky. I love to check out the newest things. This box has been pretty cool in that regard. I appreciate that Cairn Box sends me a survey about the items they sent me each month. It gives me a chance to give them further feedback they will use to customize the boxes. I also earn points for giving them feedback that can be collected and used for a free box. 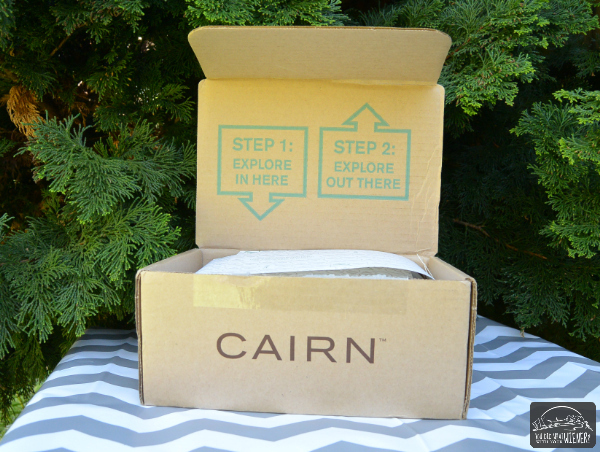 The Cairn Box is inspiration for your next outdoor adventure – delivered monthly! 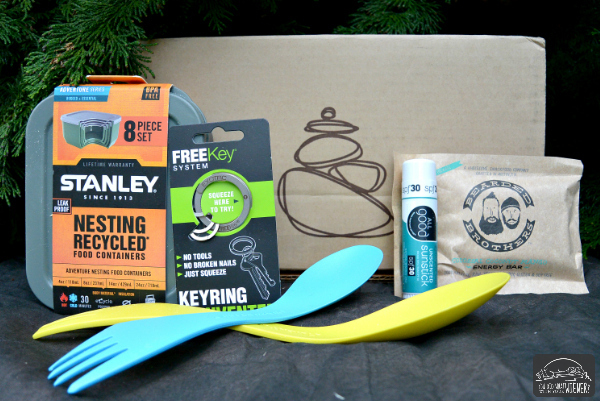 Each month you get around 4 – 6 products that cater to an outdoor lifestyle. These items might be from the gear, apparel, food/energy, skincare, or emergency/medical categories. When you sign up for Cairn Box, they ask you about who you are and what you like. They ask your gender, your outdoor interests, and whether you want alcohol-related products or not. Their intent is to put a box in your hand that best represents your outdoor interests. The box is $25 per month plus shipping and hey ship internationally (yay for our Canadian friends). I have been receiving this box for three months but haven’t had a chance to write a review until now. This is what was inside my April 2015 box. For those of you not familiar with Hydroflask, they make stainless steel, double-wall vacuum insulation bottles. These bottles keep drinks icy cold for up to 24 hours and hot liquids hot for up to 12 hours. This insulated pint glass combines the performance of the Hyrdoflask with the look and feel of a traditional glass pint. Kate’s Stash Bar contains only 8 real-food ingredients. All of the ingredients are organic and it’s gluten free. Most lip balms are the same as the next if you ask me. I really like the mission of this company though. For every 1,000 Lasting Smiles lip balms sold, one child receives the gift of a cleft lip or cleft palate surgery in the same countries as they source their ingredients. This lip balm is flavor free and super moisturizing. SparkForce™ is a compact, reliable flint-based fire starter that generates sparks in wet or windy conditions. It’s meant to be carried in a backpack survival kit for when your lighter dies or matches get wet. I am super excited about this box. My favorite thing was the Hydroflask pint.I don’t drink beer but I look forward to drinking my smoothies and cool drinks from it this summer. I already have a flint fire starter in my survival kit but my hubby doesn’t so I am going to give this one to him. I already have a lot of lip balms too. Specifically, I have a very favorite one and I don’t stray much from that. However, I get very irritated when my lips are chapped so I stash “other” lip balms in packs and purses just in case I forget my favorite. I am excited to try the snack bar. You can’t go too wrong with anything peanut butter chocolate flavor in my book. Like I said, I have been getting these boxes for three months now. Here are the past boxes. This was my March 2015 box. I was most excited about the Tenacious Tape patches. You can read about everything in the box here. This was my February 2015 box. That Bearded Brothers snack bar was delicious and the sporks make me do my happy dance. I already have two of the smallest size and really like them. They aren’t long enough to reach to the bottom of a dehydrated camping meal packet without getting food on my knuckles though. These are my answer. You can read about everything in the box here. Be Sure to Sign Up! You'll never miss an article from us about dog health, dog friendly travel, and camping and hiking with dogs. Sometimes we have giveaways too. Jessica lives and breathes everything Dachshund, hiking and camping with dogs, and blogging. Given her cumulative 25 years of owning Dachshunds, studying the breed, and organizing an 800-member Dachshund club, she's considered a breed expert by many. Jessica's dogs have been her best hiking and camping buddies for the last 16 years. She started this blog in 2010 to share what she knows. She's since won several industry awards and become one of the premier blogging experts in the pet industry. Oh my…we NEED this box!!! I had no idea there were surprise boxes for people too and one for us outdoorsy people?!? Even better. We could use everything in those boxes when we go camping and hiking. I definitely need to check this out and sign up. Thanks! Yeah, I am trying to offer some information and products for hikers (or want to be hikers) too. Glad you like the box. I didn’t know about this box! I love that it has an outdoorsy theme instead of just random beauty products or food. I’m going to have to check it out! Looks like the perfect box for people who love the outdoors. What a cool box. This would make a great gift! Wow, that looks really awesome! I canceled my beauty box subscriptions because my stockpile was getting out of hand and I wanted to allocate some funds to a monthly donation instead, but like you, I love the surprise element of getting fun and useful new stuff in the mail! I Am Not Your Vet…. I’m a passionate pet parent that shares what I know about Dachshunds and adventuring with small dogs. Some of what I share is researched facts; some of it is stuff I’ve learned through living with pets my whole life; and some of it is just good ol’ opinion. Please check with your veterinarian before your dog undertakes a new exercise routine, you introduce a new food, treat or supplement, or to confirm that anything I suggest here is a good fit for your dog.